Ms. Dowling is from the Charles E. Schmidt College of Medicine, Florida Atlantic University, Boca Raton. Drs. Anderson and Huang are from the Department of Dermatology, Wake Forest School of Medicine, Winston-Salem, North Carolina. The video is available online at www.mdedge.com/dermatology. Correspondence: Kathryn L. Anderson, MD, Department of Dermatology, Wake Forest School of Medicine, Medical Center Blvd, Winston-Salem, NC 27157-1071 (klanders@wakehealth.edu). Asboe-Hansen sign is a useful clinical tool for diagnosing toxic epidermal necrolysis (TEN). Asboe-Hansen sign can be employed to generate a fresh bulla for lesional skin biopsy in the evaluation of TEN. Schwartz RA, McDonough PH, Lee BW, et al. Toxic epidermal necrolysis: part I. introduction, history, classification, clinical features, systemic manifestations, etiology, and immunopathogenesis. J Am Acad Dermatol. 2013;69:173.e1-173.e13. Frech LE, Prins C. Erythema multiforme, Stevens-Johnson syndrome, and toxic epidermal necrolysis. In: Bolognia J, Jorizzo J, Schaffer J, eds. Dermatology. 3rd ed. New York, NY: Elsevier; 2012:332-347. Schwartz RA, McDonough PH, Lee BW, et al. Toxic epidermal necrolysis: part II. prognosis, sequelae, diagnosis, differential diagnosis, prevention, and treatment. J Am Acad Dermatol. 2013;69:187.e1–187.e16. Elston D, Stratman E, Miller S. Skin biopsy. J Am Acad Dermatol. 2016;74:1-16. Asboe-Hansen G. Blister-spread induced by finger-pressure, a diagnostic sign in pemphigus. J Invest Dermatol. 1960;34:5-9. Ganapati S. Eponymous dermatological signs in bullous dermatoses. Indian J Dermatol. 2014;59:21-23. Garcia-Doval I, Lecleach L, Bocquet H, et al. Toxic epidermal necrolysis and Stevens-Johnson syndrome: does early withdrawal of causative drugs decrease the risk of death? Arch Dermatol. 2000;136:323-327. A 25-year-old woman with no notable medical history was admitted to the hospital for suspected Stevens-Johnson syndrome (SJS). The patient was started on amoxicillin 7 days prior to the skin eruption for prophylaxis before removal of an intrauterine device. On the day of admission, she reported ocular discomfort, dysphagia, and dysuria. She developed erythema of the conjunctivae, face, chest, and proximal upper extremities, as well as erosions of the vermilion lips. She presented to the local emergency department and was transferred to our institution for urgent dermatologic consultation. On physical examination by the dermatology service, the patient had erythematous macules coalescing into patches with overlying flaccid bullae, some denuded, involving the face, chest, abdomen, back (Figure 1), bilateral upper extremities, bilateral thighs, and labia majora and minora. Additionally, she had conjunctivitis, superficial erosions of the vermilion lips, and tense bullae of the palms and soles. On palpation of the flaccid bullae, the Asboe-Hansen sign was elicited (Figure 2 and video). A shave biopsy of the newly elicited bullae was performed. Pathology showed a subepidermal bulla with confluent necrosis of the epidermis and minimal inflammatory infiltrate. An additional shave biopsy of perilesional skin was obtained for direct immunofluorescence, which was negative for IgG, C3, IgM, and IgA. Based on the clinical presentation involving more than 30% of the patient’s body surface area (BSA) and the pathology findings, a diagnosis of toxic epidermal necrolysis (TEN) was made. 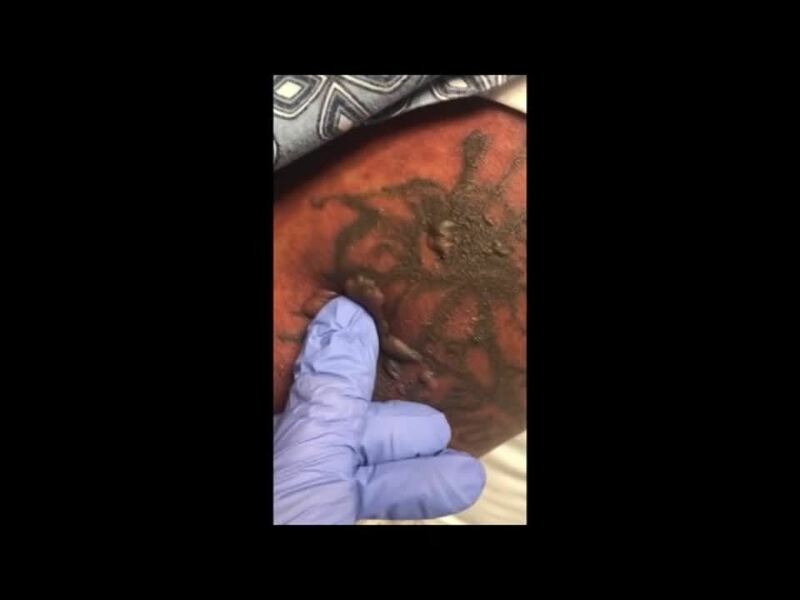 The patient remained in the intensive care unit with a multidisciplinary team consisting of dermatology, ophthalmology, gynecology, gastroenterology, and the general surgery burn group. Following treatment with intravenous immunoglobulin, systemic corticosteroids, and aggressive wound care, the patient made a full recovery. Figure 1. Erythematous macules coalescing into large patches with overlying flaccid and denuded bullae in the setting of toxic epidermal necrolysis. applied to an intact bulla. Toxic epidermal necrolysis is a rare, acute, life-threatening mucocutaneous disease within a spectrum of adverse cutaneous drug reactions. The estimated worldwide incidence of TEN is 0.4 to 1.9 per million individuals annually.1 Toxic epidermal necrolysis is clinically characterized by diffuse exfoliation of the skin and mucosae with flaccid bullae. These clinical features are a consequence of extensive keratinocyte death, leading to dermoepidermal junction dissociation. Commonly, there is a prodrome of fever, pharyngitis, and painful skin preceding the diffuse erythema and sloughing of skin and mucous membranes. Lesions typically first appear on the trunk and then follow a centrifugal spread, often sparing the distal aspects of the arms and legs. The Asboe-Hansen sign, also known as the bulla spread sign, was originally described in 1960 as a diagnostic sign for pemphigus vulgaris.5 A positive Asboe-Hansen sign demonstrates the ability to enlarge a bulla in the lateral direction by applying perpendicular mechanical pressure to the roof of an intact bulla. The bulla is extended to adjacent nonblistered skin.6 A positive sign demonstrates decreased adhesion between keratinocytes or between the basal epidermal cells and the dermal connective tissue.5 In addition to pemphigus vulgaris, the Asboe-Hansen sign may be positive in TEN and SJS, as well as other diseases affecting the dermoepidermal junction including pemphigus foliaceus, pemphigus vegetans, and bullous pemphigoid. Asboe-Hansen5 made the argument that a fresh bulla should be biopsied if histopathologic diagnosis is necessary, as older bullae may exhibit epithelial cell regeneration and disturb an accurate diagnosis. Accurate and early diagnosis of TEN is imperative, as prognosis is strongly correlated with the speed at which the offending drug is discontinued and appropriate medical treatment is initiated. Prompt withdrawal of the offending drug has been reported to reduce the risk for morbidity by 30% per day.7 Although classically associated with the pemphigus group of diseases, the Asboe-Hansen sign is of diagnostic value to the pathologist in diagnosing TEN by reproducing the same microscopic appearance of a fresh spontaneous blister. Due to the notable morbidity and mortality in SJS and TEN, the Asboe-Hansen sign should be attempted for the site of a lesional biopsy, as an accurate diagnosis relies on clinicopathologic correlation.